The perfect meal, appetizer, or late night feast, chicken wings are currently trending in Connecticut. From melt-your-face spicy to dessert wings, Connecticut boasts delicious flavor combinations. Bring some friends because this is a dish best for sharing! Just one look at the flavors on the chicken wing menu—yes, it has its own menu—will knock your socks off. To make the most of your order here, choose the smaller servings so that you can try a few flavors. Some flavor standouts are the spicy peach ginger, wasabi peanut, bacon Bloody Mary, and F.U. Hot, for something extremely spicy. This favorite restaurant serves 22 craft beers on draft, specials nights, and some of Connecticut’s best chicken wings. Ever heard of a dessert wing? Try the Reece’s Pieces wings for something different, or opt for a classic favorite of wings doused in bourbon bbq sauce. If you can’t decide among the choices on their extensive menu, a top favorite is the peanut butter bacon wings. Hot Rods Café serves over 20 flavors of wings made from juicy, tender meat. Wing flavors are separated into spicy, medium spicy, and not so spicy categories, making it easy to choose the perfect option. 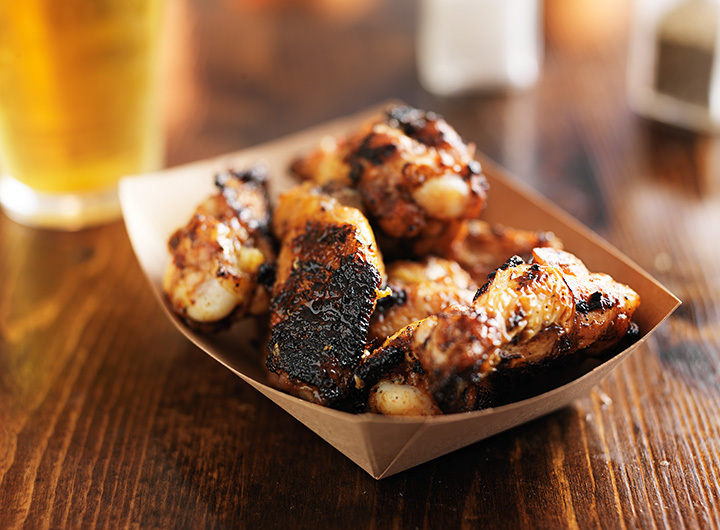 Some flavorful wing options include jerk, Thai garlic pepper, and garlic parmesan. The Food Network considers J. Timothy’s Taverne to serve the best wing sauce in America. Numerous accolades aren’t wrong, J. Timothy’s serves amazing wings. Their specialty is cooking the wings “Dirt Style,” which means that the wings are deep fried, tossed in sauce, then fried again to create a crispier wing. Amazing sides can be ordered to accompany wings and include onion straws, pretzels, and garlic bread. Locals will claim that these are the best wings in Connecticut—they are so renowned that you can even pick up a bottle of the famous Archie Moore's Buffalo Wing Sauce at your local grocery store or market. There is no denying that the Buffalo chicken wings reign supreme, however there are a variety of other notable flavors including garlic parmesan. Archie's absolutely nails classic bar food, their nachos and potato skins are also local favorites. Stop in and grab wings for yourself or for your next party. This college hang-out offers traditional wings, boneless wings, and vegetarian “wings” to be covered with numerous sauces. The sweet and savory combination of the honey ginger sauce is a nice mild option and the Beyond Wings of Death (aka Ghost) sauce will probably melt your face off with spiciness. Also on the menu are sandwiches, salads, and sides. Taking inspiration from Southern cooking, Hoodoo Brown BBQ serves an amazing, meat-heavy menu. Their smoked chicken wings are seriously tasty and come with sauce options including spicy buffalo, bbq, citrus bourbon teriyaki, garlic parmesan, and Cajun. Their other menu options are also a cut above and are best enjoyed family-style. The Hidden Still is a restaurant and moonshine bar, with an interior that encourages customers to sit back and relax. They take 25 hours to prepare their high-quality wings and sauces. Unusual flavors include cinnamon chipotle, smoked garlic, maple bourbon, and mustard horseradish. Other than wings, the Hidden Still has an impressively large menu with items inspired by international culinary favorites. Cheeks Chicken and Waffles is Connecticut’s option for this Deep South treat. In addition to chicken and waffles, they have bone-in and boneless chicken wing options with delicious sauce flavors such as the Carolina reaper, honey mustard, and buffalo. For convenience, you can also place an order online. This fast food wings option is another popular option among college students at UCONN. Their boneless wings are deliciously juicy and can be ordered by weights of half pound to a whopping six pounds of wings. Wings Over Storrs has 20 different sauce options including Jet Fuel, Cajun teriyaki, hot garlic, and West Texas mesquite. Wings come with a side dipping sauce and the standard serving of celery.